Kiahuna Beach makes a gracefull crescent from the Sheraton Kauai Resort to Marriott's Waiohai Beach Club in Poipu. It's a great beach for sunning and also a good beach for swimming and snorkeling because an offshore reef protects it from most of the wave action. The small surf and mostly sand bottom make Kiahuna Beach the preferred location for beginning surf lessons on the south shore. More advanced surfing happens further out beyond the reef. Looking eastward on Kiahuna Beach. Parking at Kiahuna Beach is very limited if you're not a guest at one of the resorts. A small public lot is located at the east end of Poipu Beach Road just past the Sheratan. Restroom facilities are located near this lot. 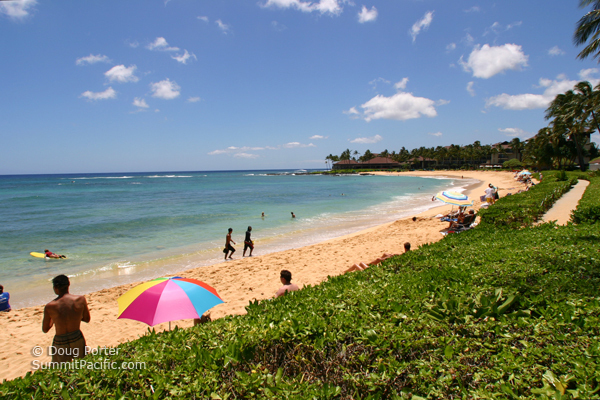 More parking is available at Poipu Beach, which is just a short walk away. 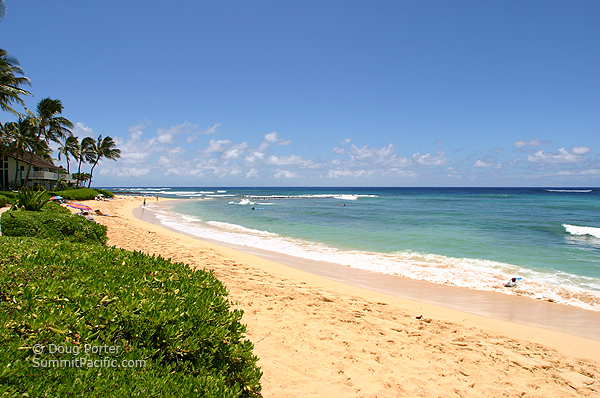 Many consider Kiahuna Beach an extension of Poipu Beach, although they are separated by a rocky point. A walkway running in front of Marriott's Waiohai Beach Club connects the two beaches. There's no lifeguard at Kiahuna Beach. Neither is there any shade, so you might consider bringing a sun umbrella. This isn't a particularly good beach to watch the sunset (if that's important to you) because the Sheraton blocks most of the view to the west. Poipu Beach is better for sunsets because it extends further south into the ocean. Nearby Vacation Rentals: With major hotels on both ends and because it's next door to Poipu Beach Park, Kiahuna Beach is one of Kauai's most popular beaches and tourist destinations. Condos nearby include Poipu Shores, Poipu Sands, Poipu Kai Resort, Sunset Kahili, and Nihi Kai Villas to the east. Kuhio Shores, and Prince Kuhio are less than a mile away to the west. Click for a list of other beautiful Kauai Beaches.